Super Bright 32 LED Flag Pole Solar Light Lit Up The Star-Spangled Banner At Every Night, Honor the Old Glory and Display Your Pride! ●20pcs high efficiency solar panels would collect more enough sun power and converted to electricity. Solar powered, Eco-friendly and energy saving. ●Built-in 3600mAh large capacity rechargeable battery could store enough power to lights up your flag at night. Work better even in cloudy day or winter. ●32 super bright leds offer wider light coverage, can illuminate star-stripes flag up to 10 hours under full charging. ●Has 2 level of brightness modes, allow your choose the light brightness as your want. ●Designed with a waterproof cover, protect LED bulbs from exposed to the rain for long lifespan. ●Auto turn on at dusk and turn off at dawn, just install the light on the top of your flag pole and the light will do the rest for you. ●Apply to most standard 15 - 25 ft flag poles with a 1/2"-thick rod at top. ●Min. Length of ornament shaft or rigged bolt required to go through our light: 1.75". ●Width of hole to fit through ornament shaft or rigged bolt: 0.55". ●The light is solar powered, don't need connect any wires, and no special tools required, very easy to install. ●Please ensure to press the ON/OFF button turn on the light and choose one of light brightness mode before installation. 1. There only has Solar Flag Light here. The ornament ball, flagpole, accessories or flag isn't included. 2. Please note our thickness of hole is 1.18'', please sure the screw rod of ornament could suitable for this our light before you buy. 3. We offer 12 months Warranty, if there has any questions, welcome to contact us. [20 Solar Panels & 4000mAh Capacity] Improved 20 solar panels capture more sunlight and store solar power into a large 4000mAh capacity built-in battery, making it light up your flag for more than 10 hours at night. [Unique Waterproof Protection Cover] Add a transparent waterproof cover to protect all of LED bulbs from rain or dirty. 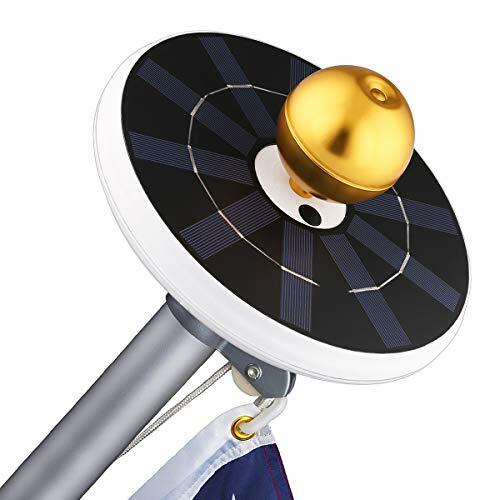 High quality material and unique design made this solar flagpole light more durable and easy to be cleaned. [Auto ON/OFF with Cutting-edge Sensor] The solar light will be AUTO ON at dusk and OFF at dawn. Just be sure to turn the light ON via the ON/OFF button before installation. [Apply to Most of Flag Poles] Apply to most standard 15 - 25 ft flag poles with a 1/2"-thick rod at top. Note: The ornament ball is not included. If you need the ornament ball, pls have a look at our store. If you have any questions about this product by Tranmix, contact us by completing and submitting the form below. If you are looking for a specif part number, please include it with your message.